I am one of those folk. When I am stressed, I make lists. I feel a sense of accomplishment when everything on the list is done. Am I alone? When we were getting prepared to move Hubby and I walked room by room looking at what needed to be done. Hubby was fine with that. What he did not love was me typing up everything that needed doing, dividing the jobs between us and expecting the stuff to get done. I posted them on the fridge. He tends to be more global than I am. He is fine with multiple projects underway. I want to focus on the projects one by one and get them done. I LOVE A FINISHED PROJECT. 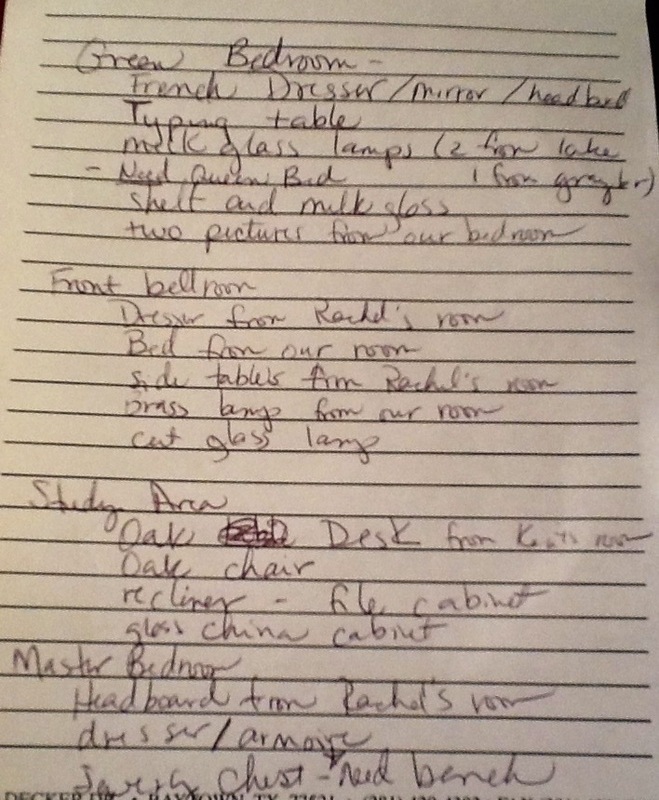 Here is my list of what furniture goes where in our new house. I am working room by room on what to put where because I will probably be at work when the stuff gets moved in. Great handwriting for a teacher huh? I feel pretty good about myself tonight because I finished my list for today. All parts of the entertainment center have poly on them. The dresser was glazed, a coat of poly applied and reassembled. Yep. I put the doors and handles back on by myself. Yep. I put the door hardware on upside down first and had to start over. I got the mirror painted (two coats), glazed and the accent color on the ornate piece. I even got the door that is going to be our bedroom headboard here at Star Hill painted and glazed. I washed all the brushes out, sorted out the paint and even cleaned up a little. I am dying to put up some pictures but I refuse to put any more pictures of our messy garage on my blog. As soon as Hubby gets back Saturday we are moving things out so I can get some shots and while everything is out I am cleaning that joint up. My next project is the sewing machine cabinet. It is going to be Sailboat Blue! I found a bench cushion with turquoise, red, sailboat blue, and green in it. 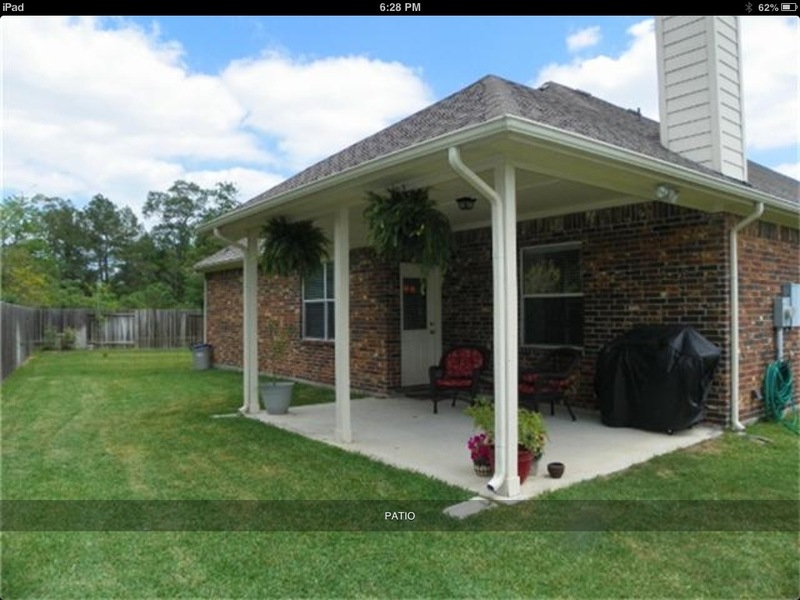 I am so excited to get going on my back porch. My turquoise chairs, a headboard and footboard bench, a fountain,and the cooler will be out there! I wish I could get started tomorrow, but I need assistance on the sink part of the cooler and I cannot move anything else. Now, back to my list. Here’s a confession for you. The first thing on my list…. is always something I already did. Just so I can cross something off. It’s silly but it still feels like I accomplished something. I get weird satisfaction just from crossing something off. I know what you mean about that sense of satisfaction!